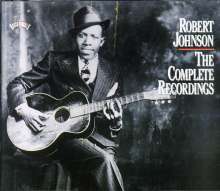 Der Artikel Robert Johnson: The Complete Recordings wurde in den Warenkorb gelegt. ROLLING STONE ALBUM GUIDE ***** "The Columbia two-CD boxed set includes a handsome book with priceless photos and a complete sessionography and disco- graphy. Keith Richards and Eric Clapton submit short appreciations of Johnson's influence on their own music, and music historian Stephan C. LaVere details specifics of Johnson's recording sessions in con- vincing fashion."